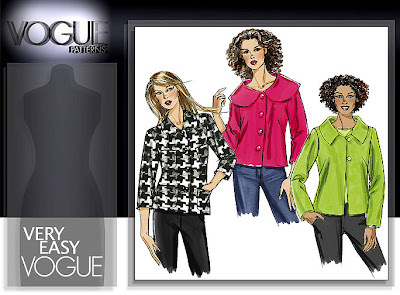 Misses Jacket in 3 variations, unlined jacket with darts and collar variations, pockets, three-quarter length sleeves, long sleeves and snap closures with button trim or loop and button closures. I'm working up Version A with a grey wool blend fabric, using the sleeves from Version C, omitted pockets and put in a lining. Despite the pattern being labeled very easy, this project gave me a run for my money. I was having issues with the collar, shoulder pads, lining and facings. Honestly, I was a nano-second from trashing it, but decided to step away from it and called my sistah-friend Andrea to keep from pulling out my hair. While talking to her and lamenting about my jacket woos an epiphany hit me and realized how to rectify the collar issue. Primarily the issue with the collar was that I was following Marta Alto's (Jackets for Real People) technique for attaching the upper collar to the lining and lower collar to the fashion fabric and at the same time trying to incorporate the pattern's collar instructions. In doing so, the collar was not laying right... talk about a total button head. Once I realized the errors of my ways....lol - I totally focused on Marta's technique. Let me tell you.... the problems just kept coming. The next issue was the shoulder pads, I'd put them in, took them out, put them back in only to take them out again because I was experiencing the linebacker look. I believe the problem occurred when I decided to shear off 5/8" from the jacket armholes. After trying the jacket on several times I noticed that I had too much room going on in the shoulder area and in decreasing the armholes I failed to take in consideration the shoulder pads. However, I'm thinking I could use sleeve heads, which would fill out the gap between the arm and the sleeve top or just leave well enough alone. Its still a work in progress despite all the issues. I'm not sure how I feel about it until its totally completed. So I will push-on and look for sleeve heads, find buttons, attach lining to the bottom, hem the sleeves and close up the opening in the sleeve. I'm sorry that you're having so many issues with this jacket. That's one reason I don't use books in addition to the guide sheet. I always read the guide sheet before starting and then try to work out any changes in my head before actually trying them on the garment. Press on you'll be happy when it's done. Nice pattern! NOT! LOL! It's a good looking one but it doesn't sound as easy as it should be. But I know you will work out the kinks and get the job done. Ooh, I really like this design! Everything looks good to me so far. I'm so glad you were able to work things out. I do like your fabric choice for this. The pattern is very nice looking. Don't you hate it when you're all excited to work and complete but your pattern has a different idea entirely ! Looks like you are doing a good job on the jacket to me. Believe me, I feel your pain when things don't want to go in right. Keep plugging at it, I'm sure you are going to have a great wardrobe addition. It's rough when you have to struggle with pattern or technique.Perseverance is one of your traits.You can do it! Yikes! I just trimmed that pattern yesterday and made a FBA. I'm going to make a few more alterations and then I'm going for it. I'm not going to line it and don't plan on using shoulder pads unless I have to because as I recall the pattern didn't call for them. Wish me luck.